What is the Sentry Calming Collar For Cats? 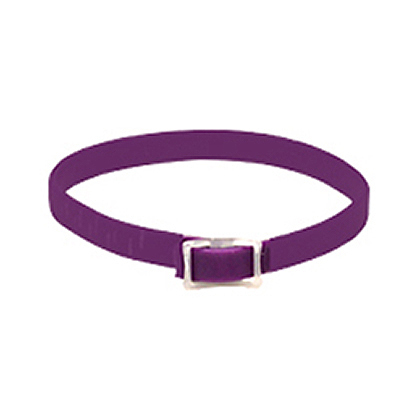 The Sentry Calming Collar helps cats in fearful or stressful situations (separation anxiety, visitors, other household cats, new baby, vet visits, and traveling). The Sentry Calming Collar provides a convenient alternative to diffusers, which are limited for use in the confines of a designated room. How does the Sentry Calming Collar work? 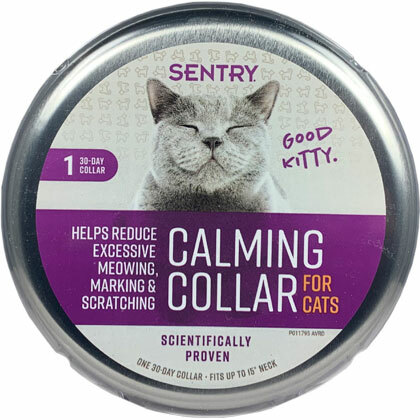 The Sentry Calming Collar is an innovative solution to help modify stress related behavior in cats using good behavior pheromone technology. This mimics the pheromone that the mother cat produces to calm and reassure her kittens and the lavender and chamomile provide a soothing fragrance. The collar works to mimic the natural way to help cats cope with fearful situations. When you first apply the collar to your cat's neck, a white powder will release. This powder activates the hormones. Remove the collar before shampooing your cat and replace it after the cat's coat is dry. Do not use collar on cats with extensive skin lesions. The Sentry Calming Collar is designed to release powder when applied, which will activate the pheromones. Wash hands after placing collar on the pet. Seal the collar in a plastic bag when not in use to prolong the effect. Remove the collar before shampooing your cat and replace it after your cat's coat is dry. Do not use the collar on cats with extensive skin lesions. The collar is designed to release the powder when applied, which will activate the pheromones. Remove the collar before shampooing your cat and replace it after your cat's coat is dry. Place collar around your cat's neck, adjusting to fit the neck comfortably. Leave 2 to 3 inches for extra adjustment. Cut off the excess portion of the collar.